Sailing for Tahiti with 127nm remaining to Point Venus anchorage. Today we raised the anchor at Niau atoll and got underway well before sunrise. Drinking in the delicious early morning cool while sipping on coffee is south pacific bliss. Every wink of lost sleep was soon forgotten as the pre-dawn sky transformed into a magical kaleidoscope of color. As Kathy whipped up a batch of baguette style French toast topped with honey, I gearing up for some early morning fishing as we navigated toward deeper waters. Despite frequently changing lures and altering course to sail over a seamount, our early morning fishing was unproductive. Visions of fresh sashimi for lunch faded into fish tacos from a long forgotten slab of fish from the back of the fridge. The tacos were great, but the fishing was unexpectedly slow. The next feature on the boundless ocean floor was a deep canyon that offered some promise. And then we hit the magic mile. A solid strike on my newest homemade lure was quite a rush, made all the better for the super calm clear waters to watch fight unfold as we landed a 25 pound tuna. Getting underway again it was just moments before aerial acrobatics ensued blue marlin gangman style. The spool winding low we were treated to one last show before a parting of line down below. Next on stage was a aerial performer of a different stripe, flashing green and blue like a flashing strobe light. A mahi leaping and a lunging she did fight, but we short distance released loosing the fight. 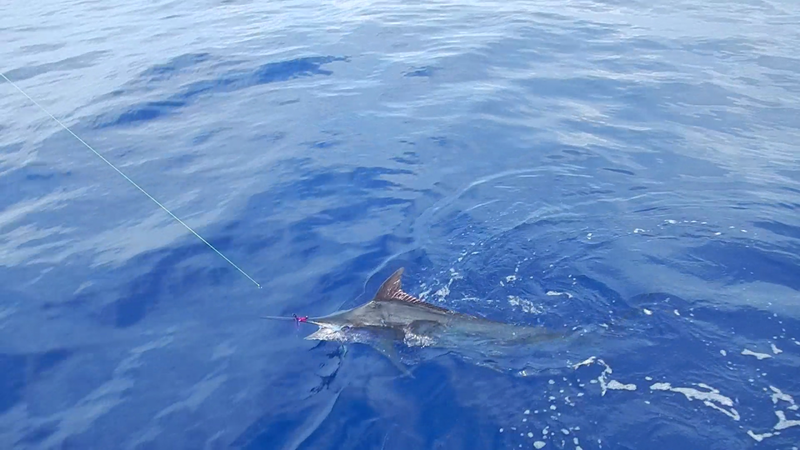 Then the final act, another blue marlin gave a tiny purple lure a real whack. Mob hit or not we gave immediate chase as line stripped off with alarming pace. Reel and muscles screamed in pain as sweat filled visions of trophy fish reigned. Line cranked in and whipped out with haste, but could Dave's arm could keep pace? On went the battle under blazing sun until the fish was released all in good fun. We hope to arrive at Point Venus anchorage on the north side of Tahiti on Wednesday evening.